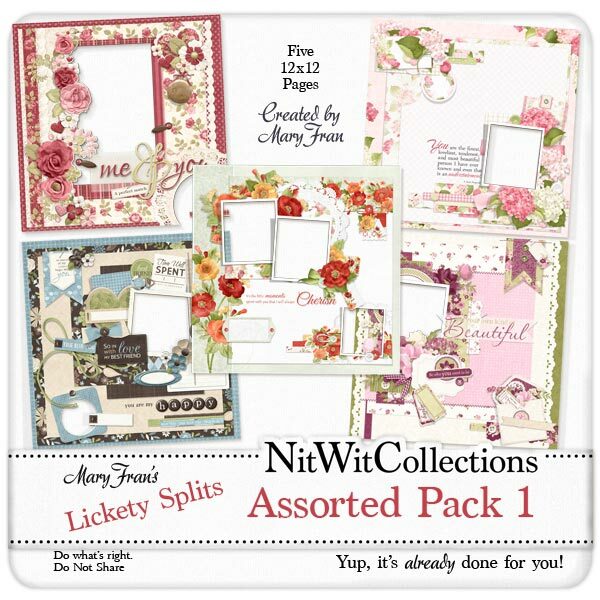 "Assorted Pack 1" Lickety Splits include 5 quick page scrapbooking layouts that you simply insert your photos into, add some journaling if you wish, and you're done! The decisions of where to put elements and photos are already done for you.....the perfect way to scrapbook if you are in a hurry and still want great looking layouts! 5 Digital scrapbooking quick page layouts (12" x 12") created from various digital scrapbooking kits from Nitwit Collections™. These layouts can easily be resized to 8 x 8 if you prefer that size.